Just because a family is on vacation doesn’t mean the family has to do everything together. Parents would certainly appreciate a “night off.” That is why offering babysitter service is a nice amenity that would appeal to many families. You can either promote your staff to the service or contract with an outside babysitting service. Either way it’s one of those amenities that score you plenty of points even if you never have to use it. 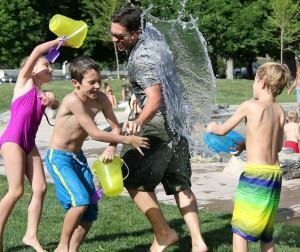 Hotels that cater to families should also create some kid friendly activities. These could be structured as “drop-off” events or fun activities for the whole family to enjoy. Some ideas could be kid cooking classes, art corner, or a pajama party and movie screening. Small investments can yield big returns. A family traveling on vacation might want to reach out to grandparents, cousins, uncles and aunts to be part of the fun. It will be great if they could all stay together. You can make that happen with special rates for group bookings. This is the type of feature you need to advertise prominently on your long list of other family amenities. As more families make reservations at your hotel you want to make sure that you keep up your standards with regards to service. That especially applies to the level of cleanliness to your hotel. Mothers will be inspecting everything closely. Not only will they be looking at the cleanliness of the rooms but also the entire property. While your housekeeping staff takes care of the rooms, you can call on Junk King Indianapolis to clear away the clutter from the rest of the grounds. The capitalize King team can quickly haul away old furniture and broken kitchen appliances. You don’t ever want them piled up outside the hotel. Junk King Indianapolis is the perfect partner to help keep your hotel clear of rubbish. This entry was posted in Indianapolis Junk Removal and tagged hotel, Junk King, junk King Indianapolis, junk removal, rubbish on July 31, 2017 by Junk King. Last updated July 31, 2017 .